We know you have busy days so it means a lot to us that you still take the time to swing by and hang out for a bit! You’ll notice by the number of features that last week’s submissions were exceptional. I had such a hard time narrowing it down and would have chosen every single recipe and project if I could have. A BIG thanks goes out to each of you for sharing your talents with us. Gracie cooked up a tasty looking Sausage Veggie Skillet dinner. I’ll bet it tasted as delicious as it looks. Lori made an old favorite ~ Frozen Chocolate-dipped Bananas. They’re easy to make and are a fairly nutritious treat. #1. Magazine Rack turned Book Caddy ~ Shonee at Hawthorne and Main. in hopes of finding a caddy similar to this. #2. Geometric Paper Bag Textbook Covers ~ Trisha at Black and White Obsession. brown paper bags and then doodle on them. This idea is much more modern and up-scale. #3. Homemade Sopapillas ~ Leilani at Keeping Up With Mrs. Smith. I want some of these sopapillas right now but I don’t have the time to make them. They’re definitely in my upcoming menu plan. #4. Driftwood Sailboats ~ Kay at White Gunpowder. I know I’m partial to sailboats but are these driftwood sailboats cute or what? #5. No-Bake Lemon Slices ~ Eliza at Eliza Ellis. These Lemon Bars are calling my name. #6. Phone Pouch Pattern and Tutorial [FREE] ~ Debbie at Wow I Like That. These little phone pouches are adorable and perfect for teenage girls. The tutorial is great and they don’t even look very hard to make! #7. Crock Pot Shredded Beef ~ Janel at A Mom’s Take. and then sit down to a tasty meal that makes me feel like I haven’t cooked at all! #8. Rosette Pillow ~ Michelle at Home for Now. This pillow is stunning. I think it would look great in any color or pattern of fabric. #9. Chalk Painted Concrete ~ Heather at Woods of Bell Trees. laundry room floor so that it looks great instead of just adequate. We hope that you ladies are loving this party as much as we are! We just can’t get over all the awesome stuff that gets shared week after week! If you didn’t make it as a feature this week keep linking up because next seek could be you! Don’t forget to check out our Pinterest board where we pin plenty of projects from each party! You’re so welcome, Heather. I absolutely adore how it turned out. 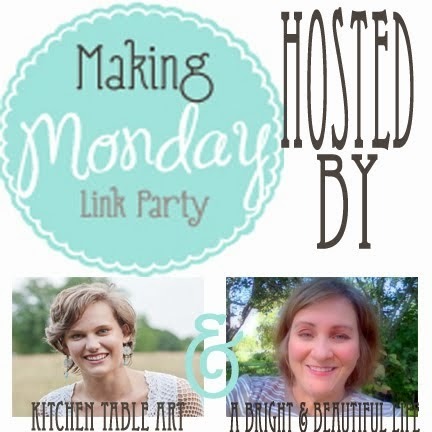 Another fun “Making Monday” Lori & Grace, thank you for putting it together. Have a wonderful sailing trip in the San Juans Lori! Welcome, Heather. We’re so glad you stopped by and partied with us. Have a great day.